Against the backdrop of rapid urbanisation, there is increasing emphasis on the importance of sustainable development in Singapore as well as globally. MND officer Cherine Liu, Deputy Director at the Eco-City Project Office (ECPO) and formerly with the Centre for Liveable Cities (CLC), believes that everyone can do their part to effect a change towards a more sustainable way of life. 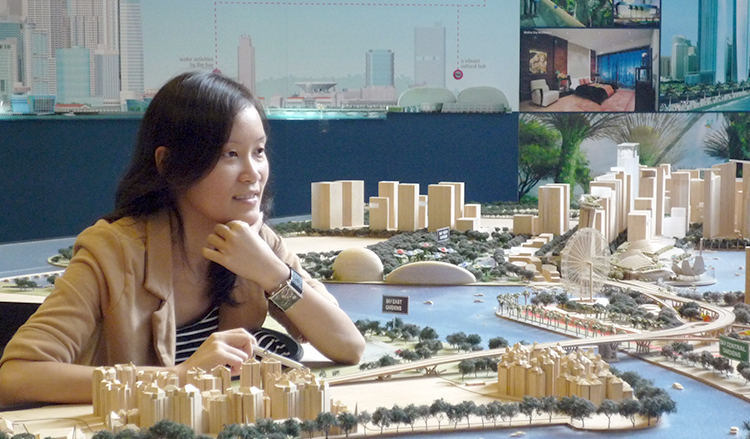 After completing her Master’s programme on the management and implementation of development projects under an MND EDGE postgraduate scholarship award, Cherine joined ECPO, which partners the Chinese government in overseeing the development of the Sino-Singapore Tianjin Eco-city. In her current role, she endeavours to further Singapore’s networks with our Chinese counterparts, and forge stronger international partnerships and collaborations as the Eco-City enters a phase of development beyond built infrastructure. Prior to that, Cherine was with CLC, a research think-tank which aims to distil, create and share knowledge on liveable and sustainable cities. One of the more memorable projects she was involved in was being part of the team that organised the World Cities Summit (WCS) Mayors Forum in 2012. Jointly organised by CLC and the Urban Redevelopment Authority (URA), WCS is a platform for government leaders and industry experts worldwide to meet and to share their visions and insights about liveable and sustainable cities. MND officers are given ample training opportunities. Apart from various training programmes available at the Civil Service College, staff can also attend in-house milestone training programmes such as the Executive Development and Growth Exchange (EDGE) and Leaders in Urban Governance Programme (LUGP), which provide officers with a better understanding of the key challenges that the MND Family faces in today’s environment and an opportunity to learn from MND’s leaders as they share key insights into the underlying principles of development – those that led to Singapore’s successes in urban development.